161 - 169 Sharing the title of Augustus with his brother Marcus Aurelius, history records Verus in a less-than-glowing light. Although an intelligent and handsome man, he didn't seem much interested in political or military affairs. Going through the motions, he followed his war generals who did the dirty work while it was noted he enjoyed a hedonistic lifestyle on the road complete with a traveling theater and frequent banquets to entertain him. It was on the return of one of these battles that he died after a stroke. Consensus holds that his greatest accomplishment was, unflatteringly enough, that he delegated administrative duties to his much more capable brother. 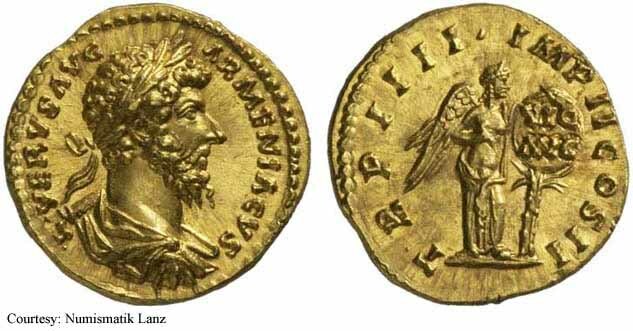 RIC 456 (Marcus Aurelius), C 51 Aureus Obv: IMPCAESLAVRELVERVSAVG - Laureate head right. Rev: CONCORDIAEAVGVSTORTRP Exe: COSII - Lucius Verus and Marcus Aurelius standing, facing each other, shaking hands. c.161 (Rome). 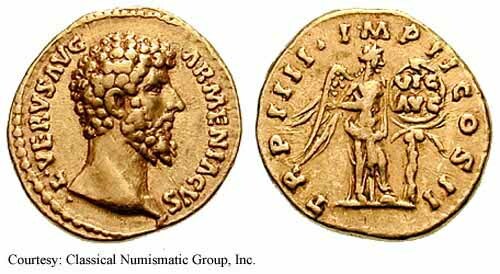 RIC 496 (Marcus Aurelius), BMC 232 Aureus Obv: IMPCAESLVERVSAVG - Bare-headed, draped and cuirassed bust right. Rev: SALVTIAVGVSTORTRPIII Exe: COSII - Salus standing left, feeding snake on altar and holding scepter. c.163 (Rome). 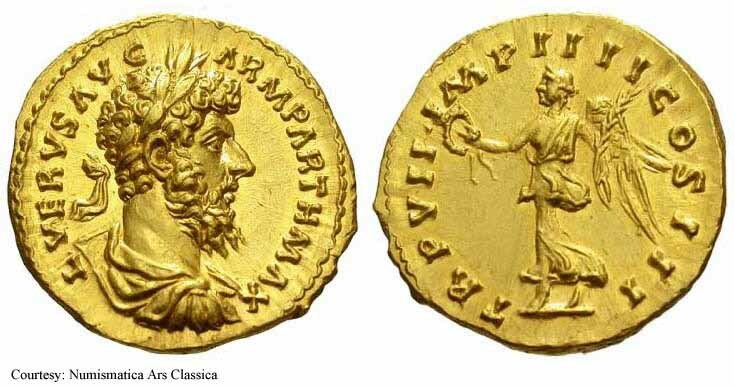 RIC 500v (Marcus Aurelius), BMC 236 Aureus Obv: LVERVSAVGARMENIACVS - Bare-headed, draped and cuirassed bust right. Rev: TRPIIIIMPIICOSII Exe: ARMEN - Armenia seated left, supporting head with right hand and resting left hand on bow; behind her, trophy. c.163 (Rome). RIC 512 (Marcus Aurelius), CalicСѓ 2154, BMC 300, C 158 Aureus Obv: LVERVSAVGARMENIACVS - Bare head right. 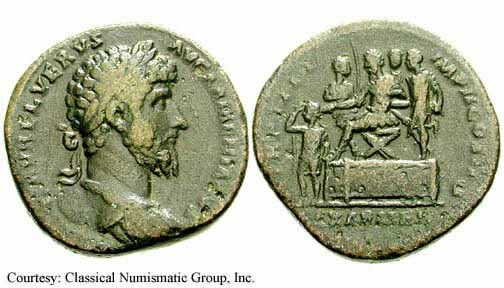 Rev: TRPIIIIIMPIICOSII Exe: REXARMEN/DAT- Lucius Verus seated left on platform, by two lictors; Armenian king Soemias to lower left, touching head. 163-164 (Rome). $9,000 1/12/05. 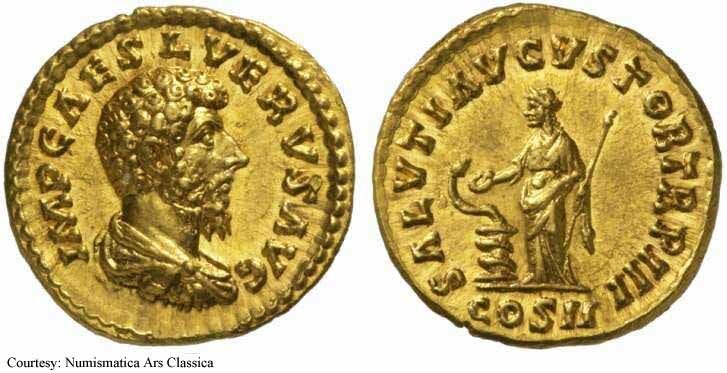 RIC 522 (Marcus Aurelius), BMC 294 Aureus Obv: LVERVSAVGARMENIACVS - Bare head right. Rev: TRPIIIIMPIICOSII - Victory standing right, holding shield reading VIC/AVG on palm. $1,750 9/25/02. 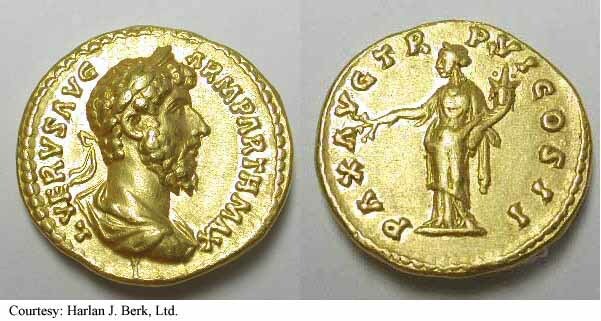 RIC 525 (Marcus Aurelius) Aureus Obv: LVERVSAVGARMENIACVS - Laureate, draped bust right. Rev: TRPIIIIMPIICOSII - Victory standing right, holding shield reading VIC/AVG on palm. $6,110 5/27/02. 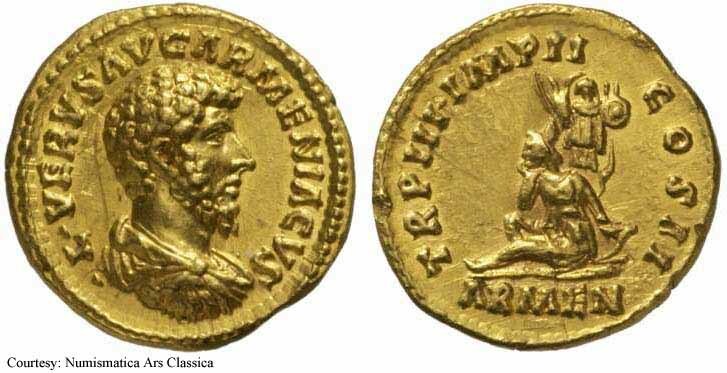 RIC 543 (Marcus Aurelius), BMC 391, C 275 Aureus Obv: LVERVSAVGARMPARTHMAX - Laureate, cuirassed bust right. 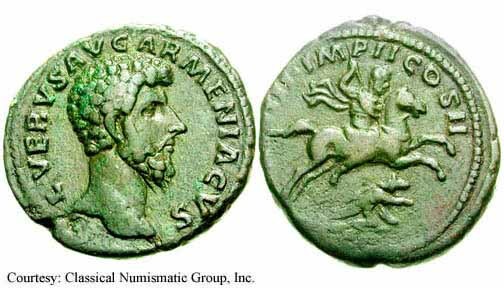 Rev: TRPVIMPIIICOSII - Lucius Verus riding horse right, spearing enemy. 165 (Rome). RIC 551 (Marcus Aurelius), BMC 424, CalicСѓ 2207, S 5344, C 337 Aureus Obv: LVERVSAVGARMPARTHMAX - Laureate, draped and cuirassed bust right. Rev: VICTAVGTRPVICOSII - Victory hovering left, holding opened wreath. 166 (Rome). RIC 559 (Marcus Aurelius), C 30 Aureus Obv: LVERVSAVGARMPARTHMAX - Laureate, cuirassed bust right. Rev: PAXAVGTRPVICOSII - Pax standing left, holding branch and cornucopia. 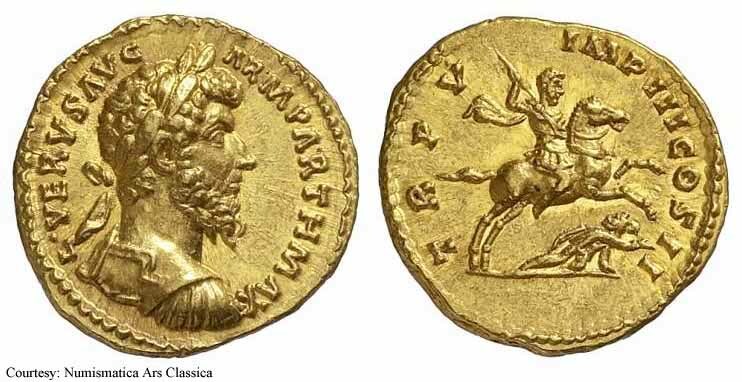 RIC 568 (Marcus Aurelius), C 52 Aureus Obv: LVERVSAVGARMPARTHMAX - Laureate, draped and cuirassed bust right. Rev: CONGAVGIIIITRPVIIIMPIIIICOSIII - Liberalitas standing left, holding abacus and cornucopia. $3,825 5/22/02. 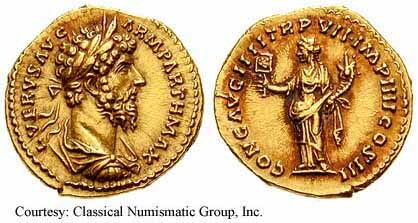 RIC 573v (Marcus Aurelius), BMC 449, C 294 Aureus Obv: LVERVSAVGARMPARTHMAX - Laureate, draped and cuirassed bust right. Rev: TRPVIIIMPIIIICOSIII - Victory advancing left, holding wreath and palm. [RIC lists for laureate, cuirassed bust right]. 166-167 (Rome). RIC 447 (Marcus Aurelius), C 21 Denarius Obv: IMPLAVRELVERVSAVG - Bare head right. Rev: CONCORDAVGTRP Exe: COSII - Concordia seated left, holding patera. 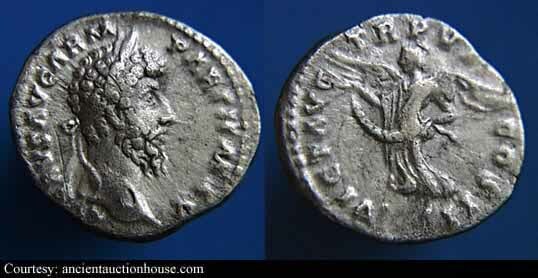 RIC 457 (Marcus Aurelius), C 61 Denarius Obv: IMPCAESLAVRELVERVSAVG - Bare headed, draped and cuirassed bust right. Rev: COSII - Lucius Verus standing left, holding globe. RIC 463 (Marcus Aurelius), C 144 Denarius Obv: IMPLAVRELVERVSAVG - Bare head right. Rev: PROVDEORTRPCOSII - Providentia standing left, holding globe and cornucopia. 161 (Rome). RIC 463v (Marcus Aurelius) Denarius Obv: IMPLAVRELVERVSAVG - Laureate, draped bust right. Rev: PROVDEORTRPCOSII - Providentia standing left, holding globe and cornucopia. RIC 482 (Marcus Aurelius), BMC 202, C 155 Denarius Obv: IMPLAVRELVERVSAVG - Bare head right. Rev: PROVDEORTRPIICOSII - Providentia standing left, holding globe and cornucopia. RIC 485 (Marcus Aurelius) Denarius Obv: LVERVSAVG - Bare head right. Rev: PROVDEORTRPIICOSII - Providentia standing left, holding globe and cornucopia. 162 (Rome). RIC 491 (Marcus Aurelius), S 5354, C 156 Denarius Obv: IMPLVERVSAVG - Bare head right. Rev: PROVDEORTRPIIICOSII - Providentia standing left, holding globe and cornucopia. 163 (Rome). 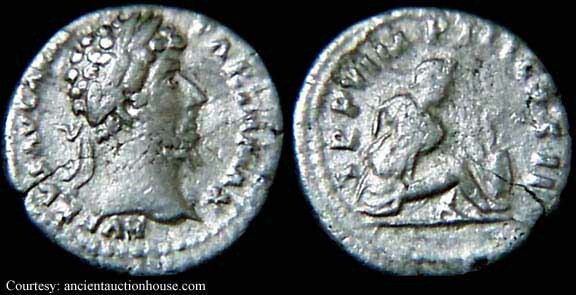 RIC 501 (Marcus Aurelius), C 6 Denarius Obv: LVERVSAVGARMENIACVS - Bare head right. Rev: TRPIIIIMPIICOSII Exe: ARMEN - Armenia seated left; resting head on hand, shield and standard behind. RIC 514 (Marcus Aurelius), C 228 Denarius Obv: LVERVSAVGARMENIACVS - Laureate, cuirassed bust right. Rev: TRPIIIIIMPIICOSII - Mars standing right, holding spear and resting hand on shield. 164 (Rome). $200 9/24/03. 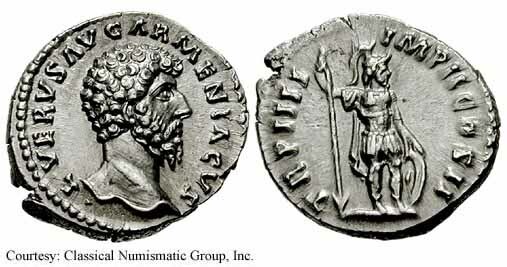 RIC 515 (Marcus Aurelius), BMC 282, C 229 Denarius Obv: LVERVSAVGARMENIACVS - Laureate head right. Rev: TRPIIIIIMPIICOSII - Mars standing right, holding spear and resting hand on shield. 163-164 (Rome). $295 8/29/03. RIC 529 (Marcus Aurelius), C 263 Denarius Obv: LVERVSAVGARMENICACVS - Laureate head right. Rev: TRPVIMPIICOSII - Mars standing right, holding spear and resting hand on shield. $42 12/15/01. Rev: TRPVIMPIICOSII - Roma advancing left, holding Victory and trophy. December 164 - December 165 (Rome). $174 2/7/03. Rev: TRPVIMPIIICOSII - Captive, bound, seated right by weapons. $70 12/17/01. 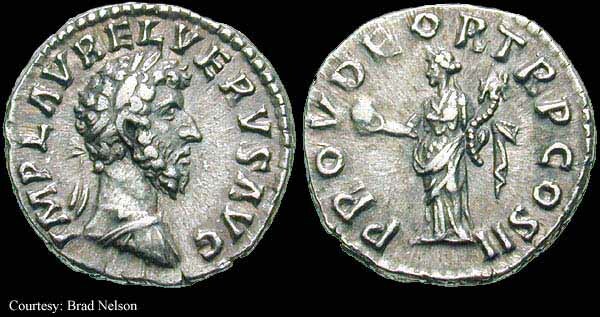 RIC 548 (Marcus Aurelius), C 286 Denarius Obv: LVERVSAVGARMPARTHMAX - Laureate head right. Rev: TRPVIIMPIIICOSII - Captive, bound, seated right by weapons. $20 11/4/01. 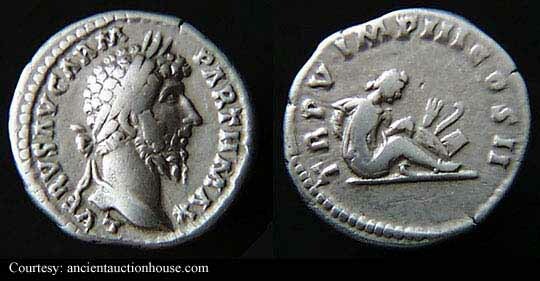 RIC 553 (Marcus Aurelius), C 339 Denarius Obv: LVERVSAVGARMPARTHMAX - Laureate head right. Rev: VICTAVGTRPVICOSII - Victory advancing left, holding open wreath with both hands. December 165 - August 166 (Rome). 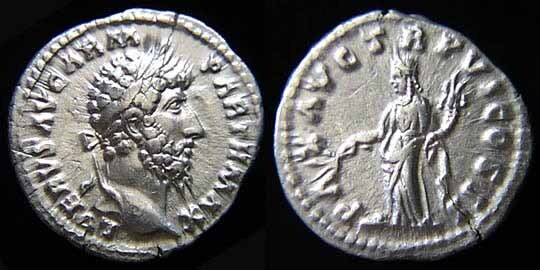 RIC 555 (Marcus Aurelius), C 127 Denarius Obv: LVERVSAVGARMPARTHMAX - Laureate head right. Rev: TRPVIIMPIIIICOSII Exe: PAX - Pax standing left, holding branch and cornucopia. $46 11/29/03. 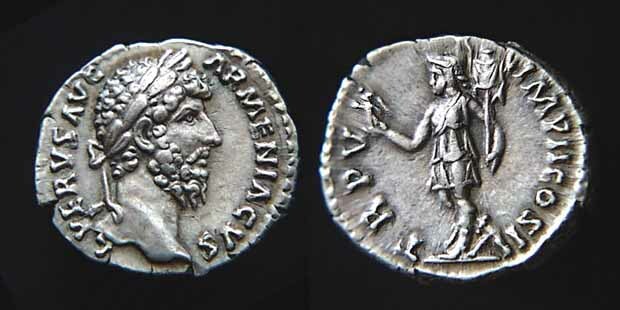 RIC 566 (Marcus Aurelius), C 279 Denarius Obv: LVERVSAVGARMPARTHMAX - Laureate head right. Rev: TRPVIIMPIIIICOSII - Victory standing right, holding shield reading VIC/PAR on palm. 166 (Rome). 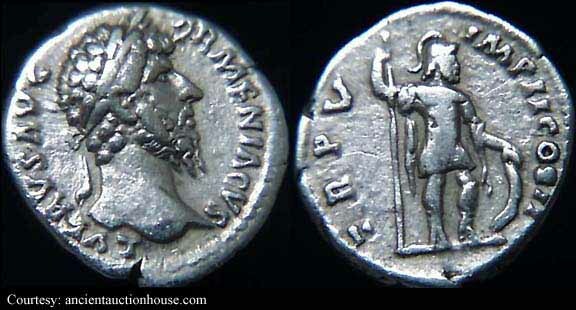 RIC 566v (Marcus Aurelius) Denarius Obv: LVERVSAVGARMPARTHMAX - Laureate, cuirassed bust right. Rev: TRPVIIMPIIIICOSII - Victory standing right, holding shield reading VIC/PAR on palm. [RIC unlisted bust type for this issue]. 166 (Rome). $91 12/14/02. 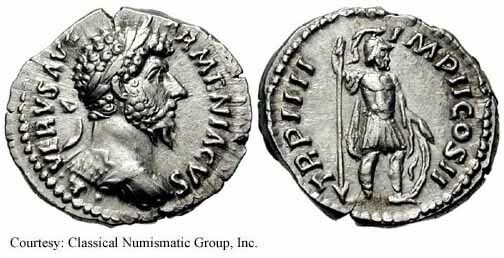 RIC 576 (Marcus Aurelius), BMC 447, C 297 Denarius Obv: LVERVSAVGARMPARTHMAX - Laureate head right. Rev: TRPVIIIMPIIIICOSIII - Aequitas standing left, holding scales and cornucopia. 166 (Rome). 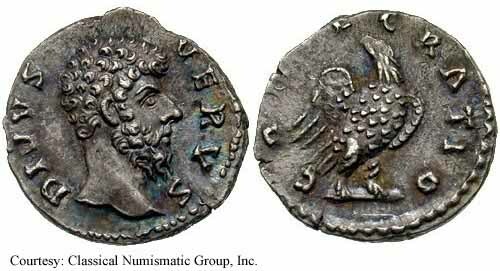 RIC 578 (Marcus Aurelius), C 310 Denarius Obv: LVERVSAVGARMPARTHMAX - Laureate head right. Rev: TRPVIIIIMPIIIICOSIII - Aequitas standing left, holding scales and cornucopia. 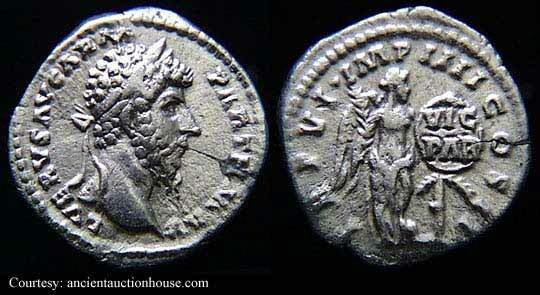 RIC 581 (Marcus Aurelius), C 313 Denarius Obv: LVERVSAVGARMPARTHMAX - Laureate head right. Rev: TRPVIIIIMPVCOSIII - Victory advancing left, holding wreath and palm. 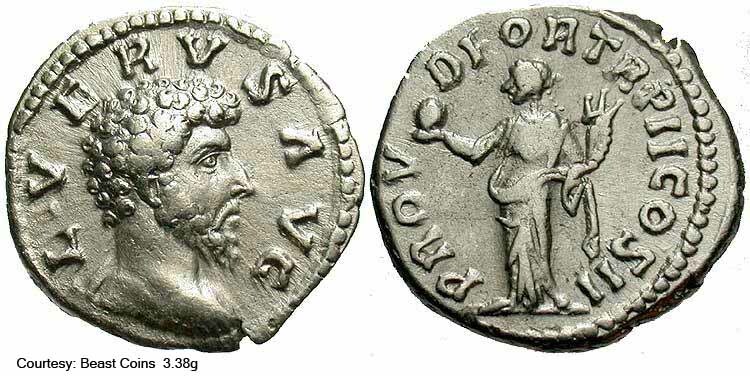 RIC 586 (Marcus Aurelius), C 111 Denarius Obv: LVERVSAVGARMPARTHMAX - Laureate head right. Rev: FORTREDTRPVIIIIMPV Exe: COSIII - Fortuna seated left, holding rudder and cornucopia. $53 6/12/04. 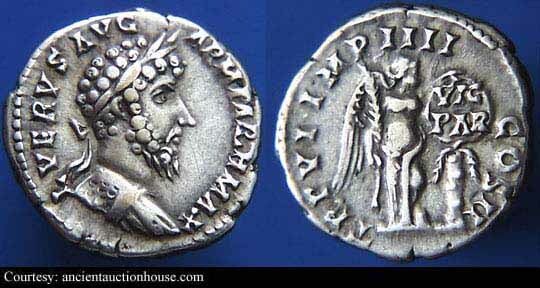 RIC 590 (Marcus Aurelius), C 316 Denarius Obv: LVERVSAVGARMPARTHMAX - Laureate head right. Rev: TRPVIIIIMPVCOSIII - Aequitas standing left, holding scales and cornucopia. December 167 - February 168 (Rome). RIC 596a (Marcus Aurelius), BMC 503, C 55 Denarius Obv: DIVVSVERVS - Bare head right. RIC 596b (Marcus Aurelius), C 58 Denarius Obv: DIVVSVERVS - Bare head right. Rev: CONSECRATIO - Funeral pyre. Gnecchi 15, C 288 Medallion Obv: LVERVSAVGARMPARTHMAX - Laureate, draped and cuirassed bust right. 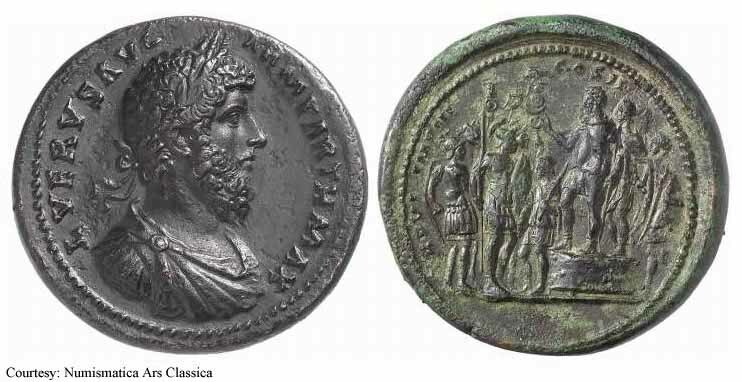 Rev: TRPVIIMPIIIICOSII - Lucius Verus standing left on platform, accompanied by two lictors, addressing several soldiers. 165-166 (Rome). Gnecchi 75,3 Medallion Obv: LVERVSAVGARMPARTHMAX - Laureate, draped and cuirassed bust right. 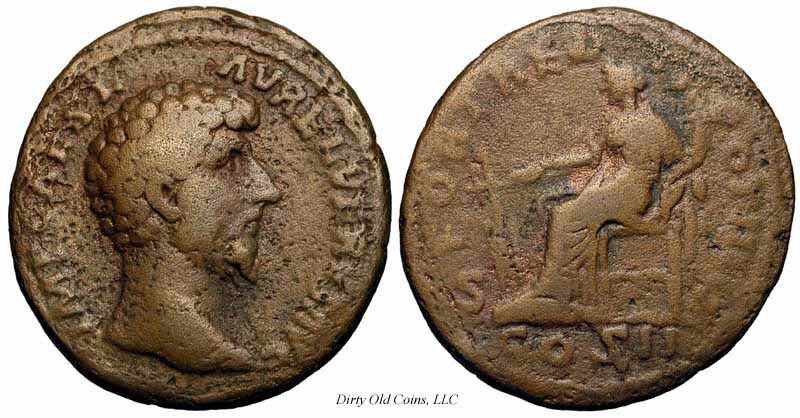 RIC 1285 (Marcus Aurelius), BMC 850, C 29 Sestertius Obv: IMPCAESLAVRELVERVSAVG - Laureate head right. 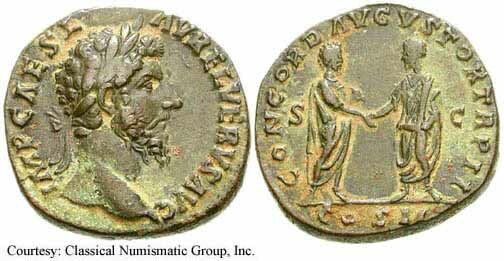 Rev: CONCORDAVGVSTORTRPI Exe: COSII - Lucius Verus and Marcus Aurelius standing, facing each other, shaking hands; S C across fields. 161 (Rome). 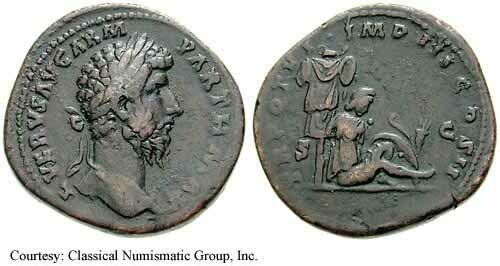 RIC 1309 (Marcus Aurelius), BMC 1026 Sestertius Obv: IMPCAESLAVRELVERVSAVG - Laureate head right. 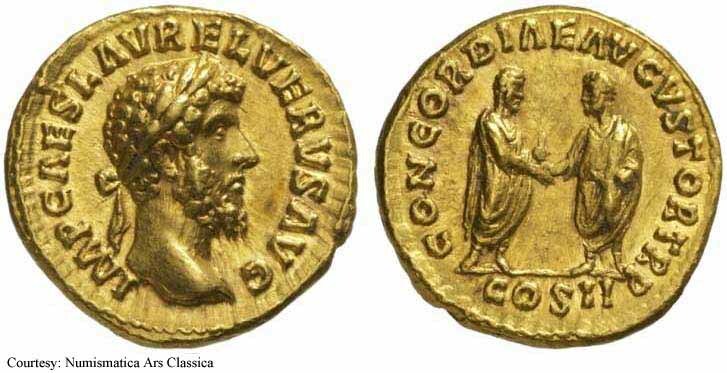 Rev: CONCORDAVGVSTORTRPII Exe: COSII - Lucius Verus and Marcus Aurelius standing, facing each other, shaking hands; S C across fields. 162 (Rome). 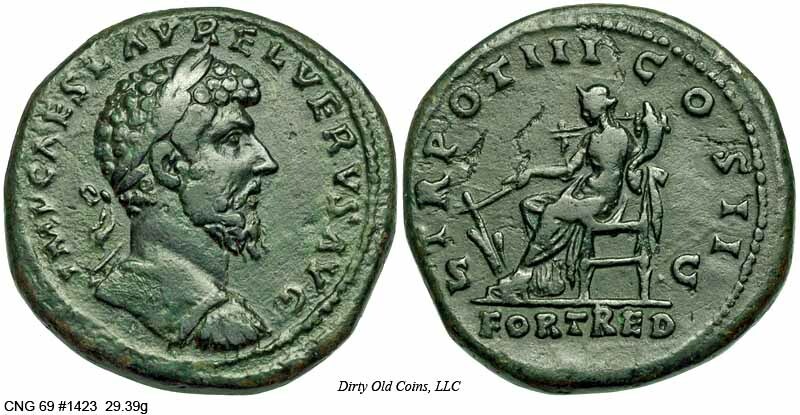 RIC 1310 (Marcus Aurelius), C 168 Sestertius Obv: IMPCAESLAVRELVERVSAVG - Bare head right. RIC 1311 (Marcus Aurelius), C 40 Sestertius Obv: IMPCAESLAVRELVERVSAVG - Laureate, cuirassed bust right. Rev: CONCORDAVGVSTORTRP Exe: COSII - Lucius Verus and Marcus Aurelius standing, facing each other, shaking hands; S C across fields. 162 (Rome). 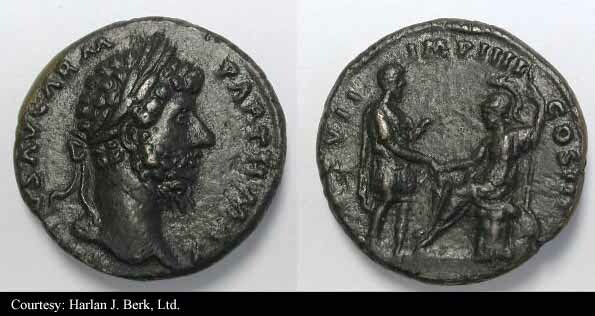 RIC 1317 (Marcus Aurelius), C 87 Sestertius Obv: IMPCAESLAVRELVERVSAVG - Bare head right. Rev: TRPOTIICOSII Exe: FORTRED - Fortuna seated left, holding rudder and cornucopia. 162 (Rome). $320 9/24/03. 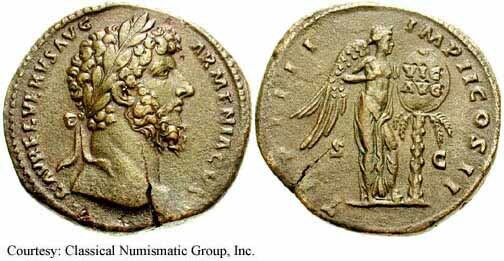 RIC 1347 (Marcus Aurelius), BMC 1058, C 96 Sestertius Obv: IMPCAESLAVRELVERVSAVG - Laureate, cuirassed bust right. Rev: TRPOTIIICOSII Exe: FORTRED - Fortuna seated left, holding rudder and cornucopia. 163 (Rome). 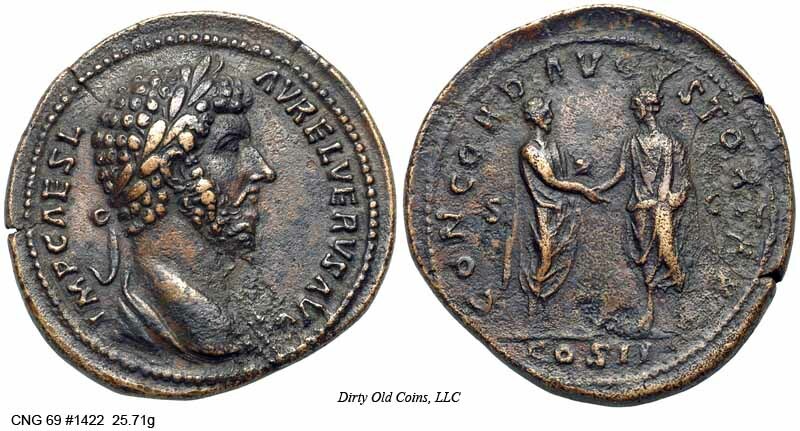 RIC 1361 (Marcus Aurelius), C 331 Sestertius Obv: LAVRELVERVSAVGARMENIACVS - Bare-headed, cuirassed bust right. Rev: VICTAVGTRPIIIIMPIICOSII - Victory standing right, holding trophy; seated captive to right. September - December 361 (Rome). 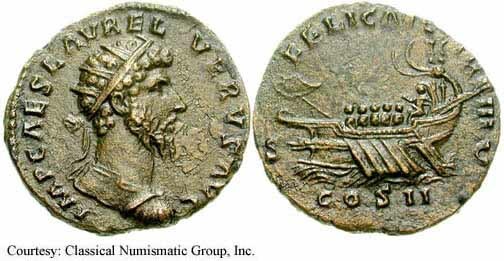 RIC 1371 (Marcus Aurelius), BMC 1106, C 161 Sestertius Obv: LAVRELVERVSAVGARMENIACVS - Laureate, cuirassed bust right. 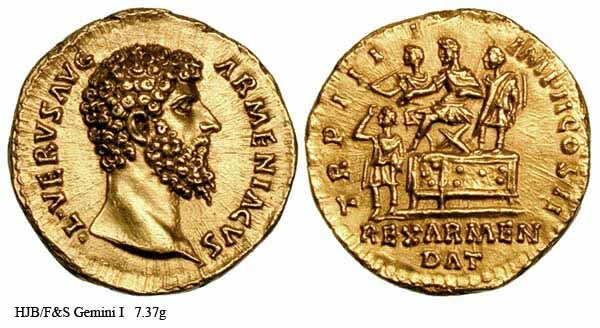 Rev: TRPIIIIIMPIICOSII Exe: REXARMENDAT - Lucius Verus seated left on platform, attended by two lictors; Armenian king Soemias to lower left, touching head. 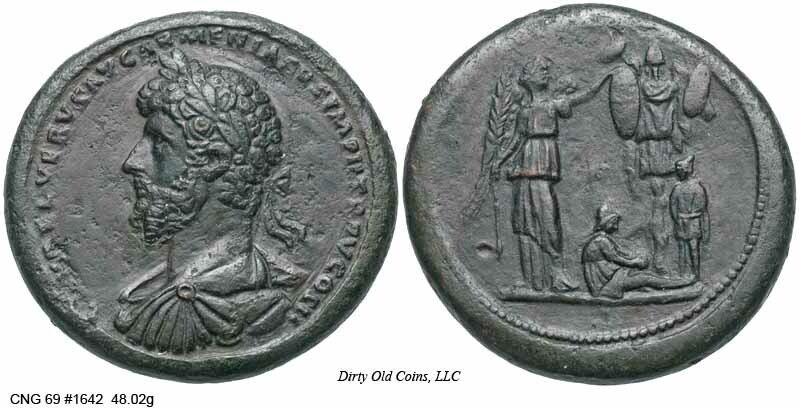 RIC 1397 (Marcus Aurelius), BMC 1116, C 250 Sestertius Obv: LAVRELVERVSAVGARMENIACVS - Laureate head right. Rev: TRPIIIIIMPIICOSII - Victory standing right, holding shield reading VIC/AVG on palm. 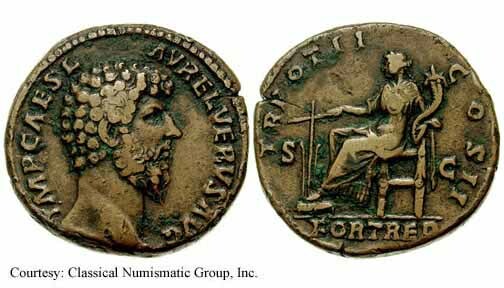 RIC 1443 (Marcus Aurelius), C 201 Sestertius Obv: LVERVSAVGARMPARTHMAX - Bare head right. Rev: TRPOTVIIMPIIICOSII - Captive seated right; trophy and weapons in background. 166 (Rome). $400 9/25/02. 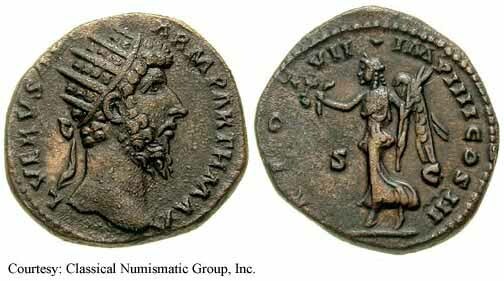 RIC 1463 (Marcus Aurelius), BMC 1327, C 299 Sestertius Obv: LVERVSAVGARMPARTHMAX - Laureate head right. Rev: TRPVIIIMPIIIICOSIII Exe: SC - Lucius Verus standing right on left, shaking hands with Roma seated to right, holding spear. 166 (Rome). Unlisted RIC, C 83 Sestertius Obv: IMPCAESLAVRELVERVSAVG - Laureate head right. Rev: FELICAVGTRPIII Exe: COSII - Galley sailing right; Nike standing right on prow. 163 (Rome). $6,000 1/13/03. 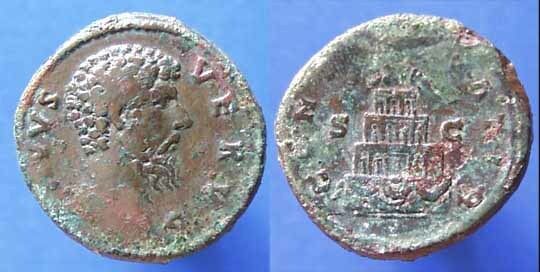 RIC 1511 (Marcus Aurelius), C 59 Medallion Obv: DIVVSVERVS - Bare head right. RIC 1300v Dupondius Obv: IMPCAESLAVRELVERVSAVG - Radiate, draped and cuirassed bust right. Rev: FELTEMCOSII - Felicitas standing left, holding caduceus and cornucopia. 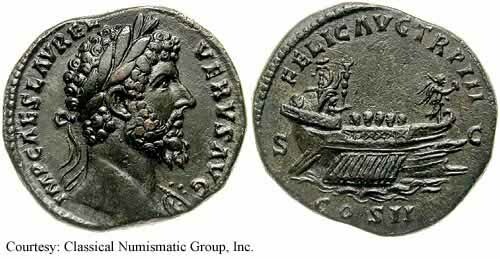 [RIC lists only as sestertius]. March - December 161 (Rome). RIC 1330 (Marcus Aurelius), C 75 Dupondius Obv: IMPCAESLAVRELVERVSAVG - Radiate, cuirassed bust right. Rev: FELICAVGTRPIII Exe: COSII - Galley sailing left. 163 (Rome). 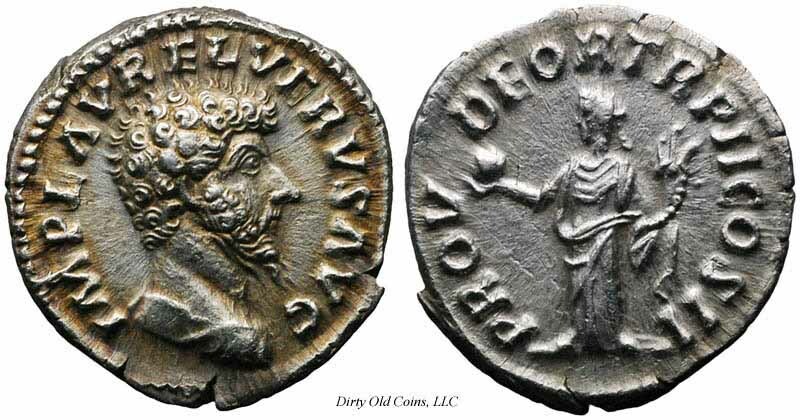 RIC 1462 (Marcus Aurelius), C 210 Dupondius Obv: LVERVSAVGARMPARTHMAX - Radiate head right. Rev: TRPOTIMPVIIIMPIIIICOSIII - Victory advancing left, holding wreath and palm. 167 (Rome). RIC 1404 (Marcus Aurelius), BMC 1131, C 257 As Obv: LVERVSAVGARMENIACVS - Bare head right. 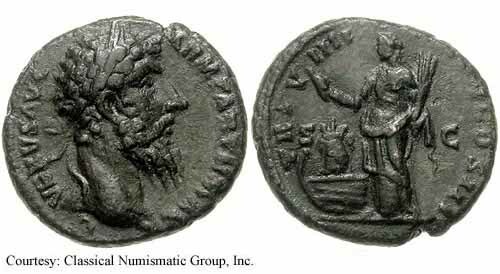 Rev: TRPVIIIIIMPVCOSII - Lucius Verus riding horse right, spearing barbarian. December 164 (Rome). RIC 1489 (Marcus Aurelius), C 326 As Obv: LVERVSAVGARMPARTHMAX - Laureate head right. Rev: TRPVIIIIIMPVCOSIII - Annona standing left, holding roll and oar; modius on galley prow to left. December 168 - January 169 (Rome). $175 5/21/03. Unlisted As Obv: IMPCAESLAVRELVERVSAVG - Bare head right. Rev: FORTREDTRPOTII Exe: COSII - Fortuna seated left, holding rudder and cornucopia. 162 (Rome).